Welcome to the premier marine aquarium store in Colorado. just off I-25 and 58th Ave in Denver, Colorado. 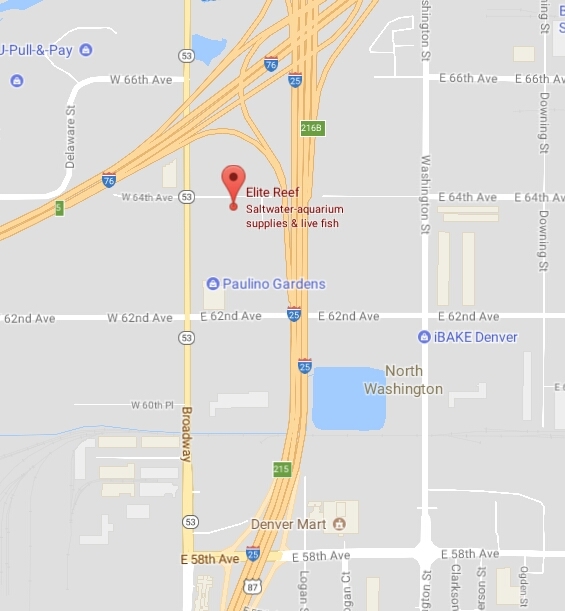 We service tanks all over the front range area, and specialize in and carry everything you need to set up and maintain a beautiful salt water aquarium. Come in and check out our huge selection including: exotic fish, rare corals, live rock, fish food, aquariums, lighting, filtration and everything else in between. If we don’t have it in stock let us know what you need and we will make sure we find it for you. Not only does Elite Reef stock everything you need, but we also hold information and customer service in the highest regards. We strive to be your biggest source of information for keeping all types of fish and reef tanks alive and thriving. Elite Reef is also in a constant state of education and will be happy to research anything you need that we do not already know.